Savoo is a money-saving and online fundraising website with thousands of great discount codes and deals from thousands of the UK’s biggest retailers including John Lewis, Argos, New Look, and Thomson – just to name a few. 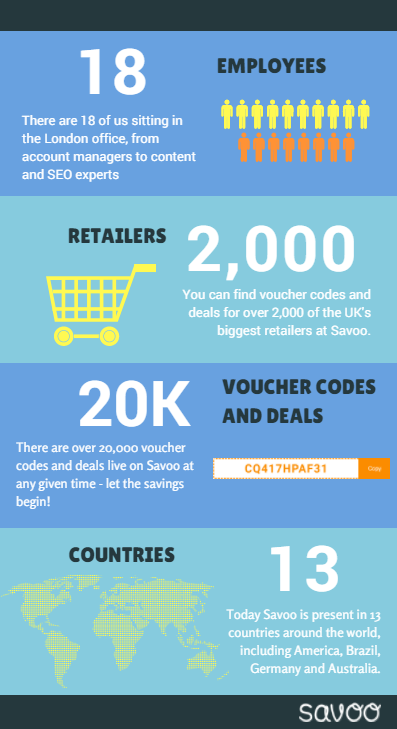 Founded in 2009 in London, Savoo is the sister company of the US-based Savings.com – the world leader in discount coupons. After the success of Savoo.co.uk, we branched out across Europe and welcomed Savoo.fr and Savoo.de in France and Germany respectively. Today, we are present in over 13 countries worldwide, and have recently launched in Mexico. In the UK alone, we have over 20,000 discount codes and deals live at any one time – whatever it is you’re buying, you’ll be hard-pressed not to find a suitable offer from Savoo. We also have thousands of exclusive offers that can’t be found anywhere else – so keep your eyes open for the ‘exclusive’ tab when you’re looking for a code or deal. All of our vouchers and deals are completely free to use, and don’t require a registration or any of your details for you to use them. It’s a really easy way to save money on everything from your everyday purchases to a once-in-a-lifetime holiday – and pretty much everything else in between. If you’re ready to start shopping and saving then make sure you head over to our homepage where you can start searching for your favourite retailers. Employees: 18. There are 18 of us sitting in the London office, from account managers to content and SEO experts. Retailers: 2,000+. You can find voucher codes and offers from over 2,000 of your favourite online shops. Voucher codes and deals: 20,000. There are over 20,000 discount codes and offers live at Savoo at any given time. Let the savings begin! Countries: 13. Today, Savoo is present in 13 countries around the world including America, Brazil, Germany and Australia.